Fishing scene embossed on front and back. 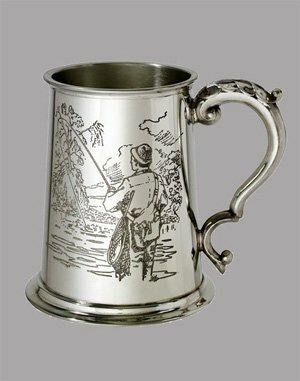 If you love fishing or know someone who loves fishing this is the perfect tankard for you or that person. One side of the tankard has an embossed image of a fisherman standing in water waiting for the fish to take a nibble. On the other side of the tankard, it shows the fish watching the fisherman from the weeds. The tankard is made of fine English pewter which is 100% lead free. It holds a full pint of your favorite beverage. This tankard is made in England where a pint is 20 ounces so there is room to pour even a little more of that beverage. This tankard has room opposite the handle for a custom engraving which allows it to personalize for a truly special gift.